6 micro-well glass bottom plates are easier to handle than glass bottom dishes. Also different micro-well size offers the flexibility of different sample size and amount of regents needed for assays. 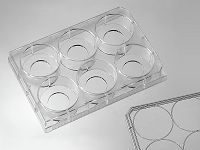 6 well plates are made from virgin polystyrene, tissue culture treated. Quote: "The mixture was then added to the centerof pretreated 20 mm diameter glass-bottomed wells of 6-well plates (In Vitro Scientific,Sunnyvale, CA)"
Quote: "Six-well cell culture dishes (In Vitro Scientific, Sunnyvale, CA) fitted with#1 glass windows in the bottom of each well were used in all experiments"